Background: Hypertensive disorders of human pregnancy, such as preeclampsia, complicate a sizeable percentage of all pregnancies, needing its early indication and warning. Aim of the Study: To measure and compare serum uric acid, serum creatinine and serum urea in preeclamptic and normotensive groups. Materials and Methods: This is a cross-sectional, hospital based study involving 105 age â€“ matched women of South India (devoid of diabetes, urinary tract infections, renal or liver disorders), all in their third trimester singleton pregnancy, at the Obstetrics and Gynecology Department of Sri Ramachandra Medical College and Hospital, Chennai, India during the period of December 2008 to July 2009. The data were collected following standard procedures and statistical analysis was done using unpaired t â€“ test. Results: The levels of serum uric acid and serum creatinine, expressed in mg/ dL were significantly elevated in preeclamptics respectively (5.29 ± 0.84 and 0.72 ± 0.387) when compared to normotensives (3.86 ± 0.92 and 0.58 ± 0.283). There was a statistically insignificant and small increase in serum urea level in preeclamptics (28.07 ± 4.97) compared to normotensives (26.46 ± 3.55). There was a lack of any correlation between the positive differences in the values of each parameter with the extent of corresponding raised blood pressure. Conclusions: the elevated values of uncorrelated serum uric acid, serum creatinine or serum urea thus precludes them to be useful for consideration as consistent predictive indicator(s) for preeclampsia or pregnancy related hypertension. 1. Egwuatu VE. Plasma concentration of urate, urea and creatinine in Nigerian primigravidae with pre-eclampsia. Trop Geogr Med. 1986, 38:11- 15. 2. Hassan TJ, Sadaruddin A, Jafarey SN. Serum calcium, urea and uric acid levels in pre-eclampsia. J Pak Med Assoc. 1991, 41:183-185. 3. Mustaphi R, Gopalan S, Dhaliwal L, Sarkar AK. Hyperuricemia and pregnancy induced hypertension-reappraisal. Indian J Med Sci. 1996, 50 : 68- 71. 4. Wakwe VC, Abudu OO. Estimation of plasma uric acid in pregnancy induced hypertension (PIH). Is the test still relevant? Afr J Med Med Sci. 1999, 28:155- 158. 5. Bowen RS, Moodley J, Dutton MF, Theron AJ. Oxidative stress in preeclampsia. Acta. Obs. Gynecol. Scand. 2001, 80: 719 – 725. 6. Pasaoglu H, Bulduk G, Ogus E, Pasaoglu A, Onalan G. Nitric Oxide, Lipid Peroxide and Uric Acid Levels in Preeclampsia and Eclampsia. Tohoku J. Exp. Med. 2004, 202: 87- 92. 7. Kang Duk-Hee, Finch J, Nakagawa T, Karumanchi SA, Kanellis J, Granger J, Johnson RJ. Journal of Hypertension. 2004, 22: 229 – 235. 8. Gulati R. Raised Serum Tnf-Alpha, Blood Sugar and Uric Acid in Preeclampsia in Third Trimester of pregnancy. J Nep Med Assoc. 2005, 44: 36-38. 10. Suhail M, Suhail MF, Khan H. Role of Vitamins C and E in Regulating Antioxidant and Pro-Oxidant Markers in Preeclampsia. J ClinBiochemNutr. 2008, 43: 210–220. 12. Sahu S, Daniel M, Abraham R, R. Vedavalli, V. Senthilvel. Study of uric acid and nitric oxide concentrations in preeclampsia and normal pregnancy. Int J Biol Med Res. 2011, 2: 390-393. 13. 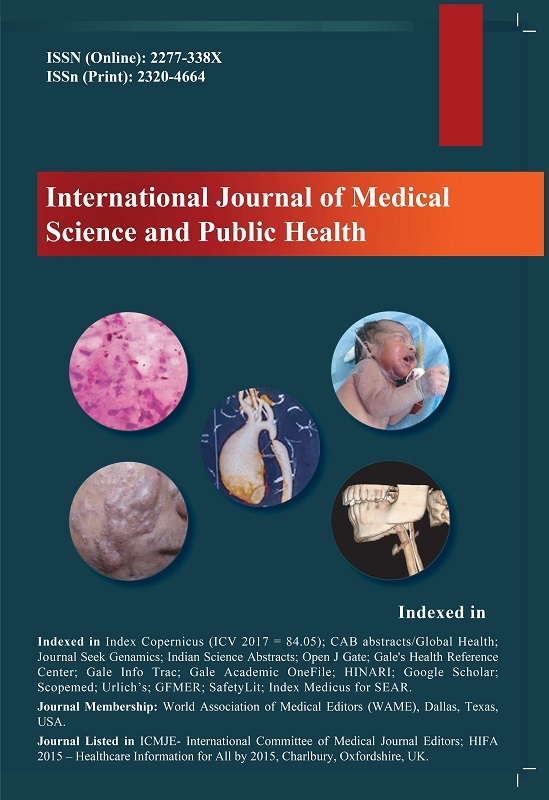 Mert I, SargınOruc A, Yuksel S, Cakar ES, Buyukkagnıcı U, Karaer A, Danısman N. Role of oxidative stress in preeclampsia and intrauterine growth restriction. J ObstetGynaecol Res. 2012,10:1111. 14. Hickman PE, Michael CA, Potter JM. Serum uric acid as a marker of pregnancy-induced hypertension. Aust N Z J ObstetGynaecol. 1982, 22:198-202. 15. Weerasekera DS, Peiris H. The significance of serum uric acid, creatinine and urinary microprotein levels in predicting pre-eclampsia. J ObstetGynaecol. 2003, 23:17-19. 16. Salako BL, Odukogbe AT, Olayemi O, Adedapo KS, Aimakhu CO, Alu FE, Ola B. Serum albumin, creatinine, uric acid and hypertensive disorders of pregnancy. East Afr Med J. 2003, 80:424-428. 17. Annabel CM, Brown MA. Could uric acid have a pathogenic role in pre-eclampsia? Nature Reviews Nephrology. 2010, 6: 744 - 748. 18. Manjareeka M, Nanda SK. Serum Electrolyte Levels in Preeclamptic Women: A Comparative Study. Internatl J Pharma Bio Sci. 2012, 3: 573 – 578. 19. Manjareeka M, Nanda SK, Roopa S, Subhashini AS. Serum calcium levels in Preeclamptic women. Ind. Med. J. 2011, 105A: 421- 422 . 20. American College of Obstetrics and Gynaecologists. Management of preeclampsia. Technical Bulletin No.1. Washington, DC; American College of Obstetrics and Gynaecology, 1986. 21. Henry RJ, Sobel C, Kin L. Estimation of uric acid in blood. Am J Clin Path 1957, 28 : 152-157. 22. Harry H, Abraham R. Estimation of Creatinine by the Jaffe Reaction A Comparison of Three Methods; Clinic Chem. 1968, 14: 222- 238. 23. Manoukian E, Fawaz G. The Enzymatic Microestimation of Urea. Z. klin. Chem. u. klin. Biochcm. 1969, 7 : 32—33. 24. Many A, Hubel CA, Roberts JM. Hyperuricemia and xanthine oxidase in preeclampsia, revisited. Am J Obstet Gynecol. 1996, 174: 288-291. 25. Ames BN, Cathcart R, Schwiers E, Hochstein P. ProcNatlAcadSci U S A. 1981, 78: 6858 - 6862. 26. Waring WS. Antioxidants in prevention and treatment of cardiovascular disease. Proc R Coll Physicians Edinb 2001, 31: 288-292. 27. Selby IV, Friedman GD, Quesenberry CPJ. Precursors of essential hypertension: pulmonary function, heart rate, uric acid, serum cholesterol, and other serum chemistries. Am J Epidemiol 1990, 131:1017- 1027. 28. Alderman MH. Uric acid and cardiovascular risk. CurrOpinPharmacol 2002, 2: 126-130. 29. Lind T, Godfrey KA, Otun H, Philips PR. Changes in serum uric acid concentrations during normal pregnancy. Br J Obset Gynecol. 1984, 91: 128-132. 30. Conrad KP, Lindheimer MD. Renal and cardiovascular alterations. In: Lindheimer MD, Roberts JM, Cunningham FG, editors. Chesley's hypertensive disorders in pregnancy. Stamford (CT): Appleton & Lange. 1999.
International Journal of Reproductive Medicine 2018; 2018(): 1. Pregnancy Hypertension: An International Journal of Women's Cardiovascular Health 2017; (): .